Russian Prime Minister Dmitry Medvedev has suggested Thailand considers creating a free trade zone with the Eurasian Economic Union. Medvedev said a free trade zone could be created in a similar way to the agreement with Vietnam. “On the one hand, it’s the Eurasian Economic Union, which consists of five countries or 180 million people. Entering the territory of one country, you get to all the five countries at once,” he said Wednesday in an interview to Nation media group during his visit to Thailand. Medvedev says this will strengthen relations and create deeper cooperation. "Colleagues should think, as you have advanced relations in ASEAN, but maybe you are also interested in this. We are ready to discuss it [free trade zone – Ed. ]," he said adding that it depends on Thailand whether the agreement on a free trade zone becomes the next big step in the relations between the two countries. According to Medvedev it opens the door to the possibility of joint cooperation in the advanced development of Russia’s Far East. “We have created a legal structure which is called the territory of advanced development. It is, in fact, a preferential zone with special taxation, simplified tax regime, simplified cession of land - perhaps it will also be interesting to our Thai partners," he said. 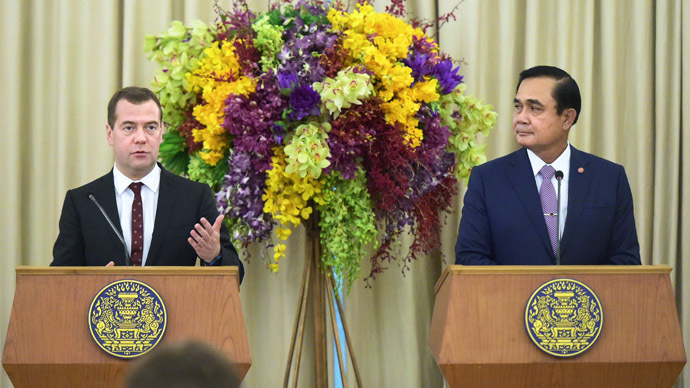 Ahead of Medvedev’s visit Prime Minister Prayuth Chan-ocha said Thailand is already Russia’s major trading partner among ASEAN countries but wanted trade to double and continue its steady growth. Around 0.9 percent of ASEAN exports are services to Russia and 2.8 percent of Russian exports are services to ASEAN. Thailand is the leading ASEAN nation trading with Russia at $2.3 billion, leaving far behind Vietnam with $609 million and Singapore at $364 million.